There’s a buzz around this year’s Masters. Tiger Woods is back. 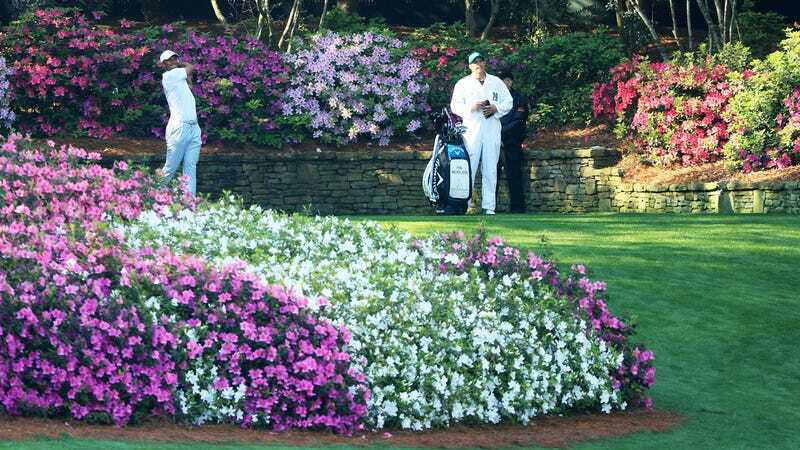 “This might be the wildest year in Masters history,” CBS Sports reports. But the biggest news out of Augusta National this week is this: A popular, stupid beer catchphrase has been banned. Shout “dilly dilly” at the Masters and you’ll hear “doobie doobie doo” as a security guard sneaks up to eject you. That’s according to Bryce Ritchie, an editor at golf magazine Bunkered. Although Budweiser’s “dilly dilly” ad primarily ran during football games last season, people have taken to yelling it at golf tournaments this year. Bunkered notes there have already been a few clashes this year between spectators and golfers. Justin Thomas had a fan ejected at a tournament in late February, then said he overreacted. (The spectator was apparently yelling “get in the bunker” at him; Thomas previously complained about fans yelling during golfer’s swings.) Last month, Sergio Garcia had a fan ejected; Rory McIlroy said he needed ibuprofen after being in a group with Tiger because of his exuberant fans. McIlroy also had a fan ejected for repeatedly shouting “Erica,” his wife’s name. “It’s gotten a little much,” McIlroy said afterwards.